A popular version of croquet using the six hoop setting. It’s simple in format and there are no extra shots. 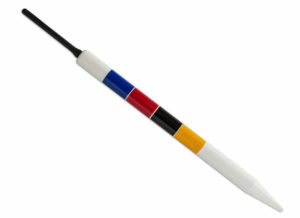 There are four balls, blue, red, black and yellow, which must be played in that order (the colours are painted on the centre peg to act as a reminder). The hoops, peg, and other balls cannot be moved to facilitate play. The person whose turn it is to play is called the striker. A turn consists of just one strike. In Singles: one player uses the blue and black balls, the other red and yellow. In Doubles: each player strikes his own ball – with blue partnering black and red partnering yellow. Toss a coin to start the game. The winner must strike first using blue ball, the order of play as shown on the centre peg is blue, red, black, yellow. Each person starts on the court within one yard of the corner closest to hoop 4. In succeeding turns you strike your ball from where it lies. The first hoop to be run is hoop 1, in the direction indicated on the diagram. Once someone has run hoop 1, everyone then plays to run hoop 2, and so on. The game proceeds in the sequence shown and the first player to run seven hoops wins. A hoop is run when no part of the ball protrudes beyond the side of the hoop from which it started (see the diagram) A ball may take more than one turn to run a hoop. If a ball other than the striker’s ball is hit through the hoop (peeled) by the striker’s ball, then the hoop counts for that peeled ball, even if the striker’s ball also goes through that hoop. Each turn consists of striking the correct ball with the face of the mallet head and with no other part of the mallet. Accidentally touching your ball counts as a strike. When it is your turn you have to take it – you are not allowed to ‘pass’. When striking your ball, be careful not to touch another ball with your mallet as this constitutes a ‘fault’. It’s also a fault to hit your own ball more than once – a ‘double tap’ – or to ‘crush’ your ball into a hoop or the peg. Great care has to be taken to avoid these faults when your ball is close to an upright of a hoop and at an angle to the opening. It’s is a fault to force the ball through regardless! If a fault is committed the turn ends, no points are scored, and your opponent can decide to take his turn from where the balls are or to have them returned to where they were. Even if it’s not your turn, you must not touch any ball, or let it touch you, or you will lose your next turn. So don’t trip over a ball and watch out for moving balls. They can move very fast! If you do touch a ball, your opponent can choose to leave it where it comes to rest or to put it back where it was before. It’s important not to play the wrong ball or play out of turn. If this does happen, then your opponent can choose whether or not to replace the balls or leave them where they are, and choose which ball to restart with. For example: if yellow was played (wrongly) after blue, your opponent can choose to continue with either the black or the blue ball. A hoop run by the wrong ball doesn’t count as a hoop point. Any ball which has left the court is replaced on the boundary at the place where it went off. c. by the striker’s ball being deflected off an opponent’s ball to put the striker’s ball beyond halfway to the next hoop. If a ball is offside, and is so claimed by your opponent, and you’re asked to do so, you must move the ball to one of two penalty positions – your opponent chooses which. The penalty points are the half way points on each of the longer boundaries. Your opponent may prefer you to take your turn from where your ball lies. 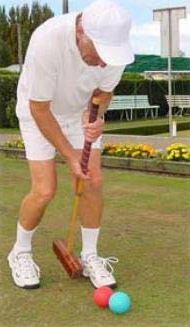 Croquet can be played by two or four or six players. The object of the game is to hit your ball(s) through the course of six hoops in the right sequence in each direction and finish by hitting them against the centre peg. The side which completes the course first with both balls wins. Each side has two balls, blue and black versus red and yellow. In singles play each player has two balls. In doubles the partners on each side must each play only their own ball. The game starts with all four balls being played on to the court in the first four turns from anywhere along either baulk line. Turns alternate throughout the game. Either, but only one, of the side’s balls may be used in a turn. Initially a turn is only one stroke, unless in that stroke the striker’s ball scores it’s next hoop, or hits another ball. When a hoop is scored the striker has a CONTINUATION stroke. When another ball is hit the striker has made a ROQUET on that ball and is entitled to a further stroke. 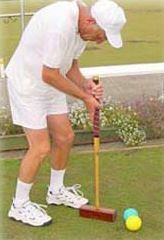 This stroke, the CROQUET stroke, is made after moving and placing the striker’s ball in contact with the roqueted ball. In the croquet stroke the striker must move or shake the croqueted ball. If the croquet stroke is made without committing 7 a foul stroke or causing the turn to end by sending a ball off the lawn (see below), the striker is then entitled to a CONTINUATION stroke. 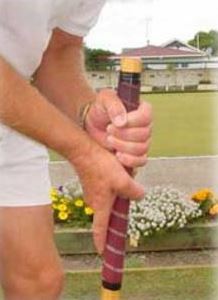 The turn ends if, in the croquet stroke, the croqueted ball is sent off the court, or the striker’s ball is sent off without first making another roquet or scoring a hoop point for itself. Note however that if the striker’s ball goes off the court after running a hoop the turn does not end. The ball is placed on the yard line and the striker plays his continuation shot. Similarly, when a ball is roqueted off the court it is replaced on the yard line and the croquet shot is played. (It doesn’t matter if the striker’s ball goes off the court because when it hits the other ball it becomes “in hand”). During a turn the striker may roquet, and take croquet from, each ball once, unless his ball scores another hoop, when he may make a further roquet and croquet on each ball. Thus a “break” may continue for a number of strokes. Scores a hoop and makes a roquet in the same stroke, immediately takes croquet. Makes a roquet in a croquet stroke immediately takes croquet. Scores a hoop for his striker’s ball in a croquet stroke, plays only one continuation stroke. Scores two hoops for his striker’s ball in one stroke, plays only one continuation stroke. When it has made a roquet. When it is off the court or in the yard line area. It is to be placed before the next stroke on the yard line at the point where it left the court. However only at the end of the turn does the striker’s ball in the yard line area become “in hand”. Touches the head of the mallet with the hand or causes the mallet to strike the ball by dropping, or throwing, or kicking , or hitting the mallet. Rests the shaft of the mallet or a hand or arm on the ground. Rests the shaft of the mallet or a hand or arm directly connected with the stroke against any part of the legs or feet. Pulls or pushes his ball so that it changes course once initial contact has been made. Moves or shakes a ball at rest by hitting a hoop or the peg with the mallet or any part of the body or clothes. Crushes the striker’s ball into a hoop or the peg (unless the striker’s ball is pegged out in the stroke) when still in contact with the mallet. (crush stroke). Touches any other ball, other than the striker’s ball, with the mallet. Touches any ball with any part of the body or clothes. Plays a croquet stroke which fails to move or shake the croqueted ball. Plays a stroke that is likely to cause and does cause substantial damage to the court by the mallet. After making a fault the striker’s turn ends and no point is scored in that stroke counts. The adversary is entitled to choose either to replace the balls where they were before the fault, or to leave them where they came to rest at the end of the foul stroke. The upper hand grips the shaft near the top with the knuckles pointing forward. The lower hand supports the back of the shaft with the thumb down. The space between the hands is a matter of comfort, but it is usually better to have them close together. Both hands grasp the top of the shaft with the knuckles in front and the thumbs uppermost. The hands are nearly always very close together. This grip allows a big back swing. Both the upper and lower hands grip the shaft with the palms either behind or to the side. The grip is usually lower down the shaft than with the other styles. To a large extent success depends upon being able to roquet another ball accurately. If you hit it you get two more shots, the croquet shot on the roqueted ball and a continuation shot as well. It is well worth taking trouble to achieve this accuracy. Stand back from your ball along the extension of the line joining your ball and the ball to be roqueted. Then walk forward, “stalking” your ball and keeping your eye on the aiming point. This helps to get your feet and body correctly aligned with the direction of the stroke. When you arrive at the ball swing the mallet smoothly and easily from the shoulders, keeping your eyes fixed on your ball. Don’t look up until after the ball has been struck. The most common reason for missing a roquet is lifting the head prematurely. Initially you may be pleased enough just to hit the roqueted ball at all. You will soon discover the benefit of being able to send that ball some distance in the direction you want it to go in order to make your subsequent croquet shot easier. This is called a RUSH, and should only be attempted if the target ball is quite close, not more than a couple of feet to start with. Because the target ball is quite close it is easy to take your eye off your own ball to look at the target ball, with disastrous 11 results. Some players stand back an inch or two from their own ball when playing a rush to avoid the tendency to strike down on the ball and cause it to jump, possibly even over the target ball. If the target ball is roqueted off centre it will go off at a tangent. This is a CUT RUSH. If you want to rush it to the right aim slightly to the left of centre and vice versa. This stroke is used when you want to send your own ball some distance, leaving the croqueted ball almost where it was. Place your ball in contact with the roqueted ball at right angles to the direction in which you want your ball to travel. It is permissible to lie your mallet on the ground with the handle pointing exactly where you want your ball to go and the head just touching the two balls. This will indicate the direction in which your ball will go. When playing this stroke be careful to aim your mallet slightly in towards the roqueted ball so that it moves after impact. If it doesn’t move or at least shake it is a fault and your turn ends. Note that aiming slightly in towards the roqueted ball will not alter the direction in which your own ball will travel, which will still be at right angles to a line joining the centres of the two balls. Because the croqueted ball hardly moves, gauging the strength of the shot is almost the same as for a single ball shot. In the Drive shot two balls are placed in line in contact and the rear ball is struck along the lines of the centres and with a normal follow-through. The croqueted ball will travel about four or five times further than the striker’s ball. Knowledge of this ratio is important as it affects all straight croquet strokes. The ratio can be decreased by standing a little closer to the ball, and increased by standing slightly further back. The Stop Shot is used when you want to send the croqueted ball much further than your own ball. Stand a little further back from the ball than in a normal shot thus raising the front face of the mallet a little. On the forward swing of the mallet the heel must be grounded at the moment of impact to ensure that there is no follow-through. Be careful not to ground the mallet too soon and stop the mallet before it strikes the ball. This is nevertheless counted as a stroke and if the croqueted ball didn’t move your turn ends! Some players don’t attempt to ground their mallet, but instead relax their grip on the mallet at the moment of impact thus reducing the chance of the miss-hit described above. With practice it is quite possible to send the forward ball eight to ten times further that the rear ball. This is the opposite of the Stop Shot and is the most difficult shot to play accurately, particularly for elderly players as it requires bending quite steeply from the waist and the knee and retaining a good balance at the same time. This shot is used when the striker’s ball has to travel as far or even further than the croqueted ball. To achieve this stand well forward over the balls with the left foot abreast the front ball and the right foot withdrawn (for a right-handed player) keeping the weight mostly on the front foot. 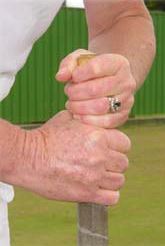 Lower the grip with both hands until the lower one is near the mallet head but not touching it (a fault). In this position the mallet should be at an angle of about 45 degrees when it strikes the ball. Try and sweep the balls forward with plenty of follow through rather than striking them. Generally the further forward you stand and the lower your hands the further the back ball will travel. When playing a croquet shot you will generally want the two balls to go in different directions. To do this line up the two balls in the direction you want the croqueted ball to travel. It will go along this line regardless of the direction in which you send the striker’s ball. Next determine which direction you want your striker’s ball to go. Now split the angle between these two directions. This is the line along which to swing your mallet. It can be helpful to point your mallet along the line you want your ball to travel when splitting the angle. Remember to follow through straight along the line of 14 the split, and avoid the temptation to allow your mallet to curve away in the direction you want your ball to go. Split shots can be played as stop shots, standard shots, half rolls or roll shots depending upon the relative distances you want the two balls to travel. These are occasionally used in desperate situations when a player wants to jump over a ball in the hoop, or to run a hoop at a sharp angle. The shot imparts a considerable spin to the ball, which with a bit of luck will help to get the ball through the hoop. Stand well over the ball and strike downwards at an angle of about 45 degrees holding the mallet well down the handle. It isn’t an easy shot but quite fun to try and very satisfying if it comes off. Be careful not to damage the lawn as this is a fault. When two or more balls have to be placed in contact on the yard line or in the corner, one of which is the roqueted ball, the striker has to take croquet from the roqueted ball while it also is in contact with the third ball. In the same stroke as the croquet shot the striker’s ball is also deemed to have roqueted the other ball in contact. The striker’s ball is then “in hand” and must croquet the other ball. Positioning the balls for a cannons to achieve a desired outcome is complicated. Advice should be sought from an experienced player. The hoop shot has to be very accurate as there is only 1/16 of an inch clearance on either side of the ball. Compare this with a roquet shot, in which the aim can be three inches out on either side and still strike the target ball! It follows that great care should be taken in stalking the ball. Swing the mallet smoothly and gently and follow through. This will impart forward spin to the ball and this spin will help it through the hoop even if the aim is a little “off”. When a hoop shot has to be made from an angle, aim to just miss the near upright so that the ball bounces off the far upright through the hoop. If it touches the near upright it will almost invariably stick in the hoop. Do not try and force the ball through the hoop by hitting hard and hoping for the best. A ball has run the hoop when it has come to rest in a position where it cannot be touched by a straight edge placed across the playing side i.e. the side that the ball enters the hoop. The game starts with the toss of a coin (or mallet), the winner having the choice of playing first or second, the loser having the choice of balls. The first four turns are used to play all four balls onto the court from any point on either baulk line. Don’t be tempted to try and run the first hoop from the baulk line. You are most unlikely to succeed, and even if you do there will be small chance of making a break. On the other hand if you fail and bounce off the hoop you present your opponent with an easy target and a good chance to make a break. A commonly used start is for the first player to send his ball off the court on the east boundary in the vicinity of hoop No 4. His opponent then lays a tice to a point on the west boundary near enough to entice his opponent to shoot at it and miss. The first player now has the choice of either hitting at the tice or joining up with his partner ball on the east boundary, and possibly roqueting it. If he misses, his opponent should shoot hard at his first ball so that if he misses his ball will end up near corner ll as he won’t want to leave both his balls in the vicinity of hoop No 1 for his opponent. A Break is the process of running more than one hoop in a single turn. If you can utilise all four balls in a four ball break it is relatively easy to maintain the break and run several hoops in one turn. The essence of making a break is to position a ball close to your next hoop (the pilot ball) and another ball (the pioneer ball) as close as possible to the following hoop in order. After running the hoop with the help of your pilot ball you must send it to the next hoop but one to become the new pioneer ball, while the former pioneer ball becomes the new pilot ball. The fourth ball should be positioned somewhere near the centre peg and is called the pivot ball. By using the pivot ball you make the other shots in the break easier to play. Let us suppose that your Blue ball is on the boundary about 10 yards from your hoop, No I. The Red ball, called here the pilot ball, is perhaps five yards from your ball, near the hoop. The Yellow ball is somewhere near hoop No II and will serve as the pioneer ball. The Black ball is somewhere near the centre and is the pivot ball. Roquet Red with your Blue ball and in the process rush it a short way towards the hoop (No I). Now you croquet Red with a split croquet shot, sending it two or three yards beyond the hoop and your own ball, hopefully, ends up a foot or two in front of the hoop. Run the hoop gently with your continuation shot so that Blue ends up a yard or so the other side of the hoop near Red. You must now send Red to act as the new pioneer ball at hoop No III with your next roquet and croquet shots. 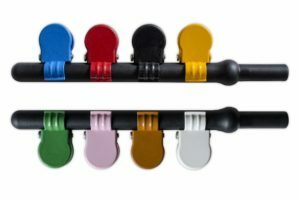 Ideally your roquet shot will rush Red to somewhere near the black pivot ball so that you have a relatively easy croquet shot to send Red accurately to hoop No III and Blue to stop near Black. You now roquet Black gently and then take off from it to Yellow with your croquet shot. You can now roquet and croquet Yellow (which is now the pilot) to put Blue a yard or so in front of hoop No II, and run the hoop. 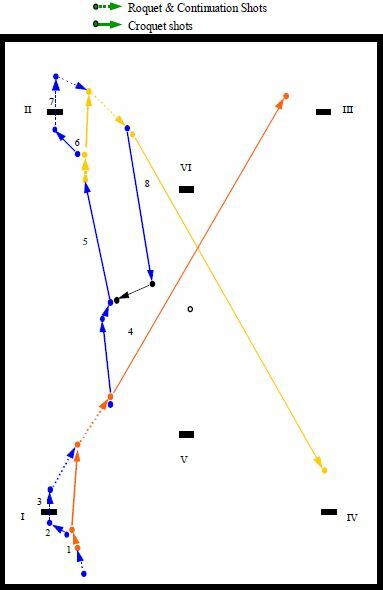 To keep the break going you must now roquet and croquet Yellow up to hoop No IV to become the new pioneer, at the same time sending the Blue ball to the pivot Black. Roquet and take off from Black to Red, which is now the pilot at hoop No III. You have now established a four ball break. You have your pilot at the next hoop, and the pioneer at the hoop after that. So each time you run a hoop you send the former pilot to become the 17 pioneer at the next hoop but one, with the assistance of the pivot near the centre to make your roquet and croquet shots easier. Provided you can maintain this sequence and place the pioneer ball reasonably close to it’s hoop, you should be able to keep the break going for several hoops. All the strokes used in the break are fairly easy ones. If you fail to position the pioneer accurately you may be able to send the pivot to act as pioneer in it’s stead. Expert players frequently make a break of twelve points in a single turn. Once you have hit a roquet and are the in-player you have the advantage, which you should try and retain at the end of your turn. Basically this involves making it as difficult as possible for your opponent to make a roquet and as easy as possible for you to make your next hoop in your next turn. Obviously it is wise to leave your opponent’s balls widely separated from each other and from your balls, which should be close enough to enable you to roquet them at the start of your next turn. If, however, you have left your opponent’s balls within roqueting distance of each other, don’t join up with your partner ball, as this will give him two balls to play instead of one. Rather send it to the opposite boundary or a corner where it will be difficult for your opponent to use. To a large extent your tactics will depend upon your confidence in your ability to roquet accurately and your assessment of your opponent’s accuracy. At the start of a turn you may find that your opponent’s balls are laid up near each other while your two balls are well separated. If you hit at your partner ball and miss your opponent will gain the innings, and the closer your balls are to each other the easier it will be for your opponent to make use of them. If you can take a shot at one of your opponent’s balls which will leave it well clear if it misses, that may be your best option. When making a break try and keep all the balls ahead of your next hoop. If you leave one behind it will be difficult to carry on with the break. If your opponent is well positioned to make a break try and leave your ball in a safe position in a corner behind the last hoop he made. If your two balls are going for different hoops try and leave one of your opponent’s balls at each of them so that if he moves one you will still have a pilot ball at the other. Similarly, don’t leave your opponent’s balls by their partner’s hoop, as this gives them a pilot for that hoop. Rather leave them each by their own hoop so that they won’t have a pilot. Try and “wire” you opponent’s balls from each other or from your balls. 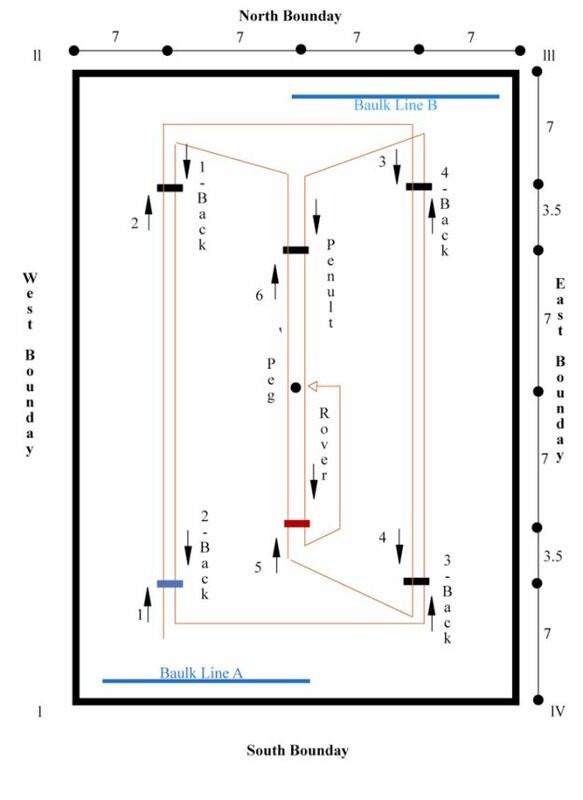 But beware, if you wire a ball so effectively that it doesn’t have a clear shot at any other ball it is entitled to a lift and can be lifted and played from either of the baulk lines at the start of it’s next turn. A ball lying within the jaws of a hoop, for instance, is wired from the other balls if the opponent was responsible for it’s position. When laying up at the end of your turn try and position your balls by a boundary but not so close to each other as to present a double target. This will discourage your opponent from hitting at them. Don’t be too cautious. If your opponent has left a ball close to your next hoop and you have a 50% chance of hitting it, it often pays off to “have a go”. As you approach the end of the game it is a wise precaution not to run your forward ball through the last (rover) hoop while your backward ball still has several hoops to make. Otherwise if your turn should end you run the risk of having your ball pegged out by your opponent’s rover ball. You would then have only one ball to play against your opponent’s two and even if you are several hoops in front you could easily lose the game. The ideal situation is to peel both balls through the rover hoop together and then peg them out together. Croquet Associations and clubs have a handicapping system which takes the form of bisques, or extra turns which are allowed to weaker players. They range from -5 for top players to 20 for beginners. A bisque is simply an extra turn which may be taken at the end of any turn at any time in the game and must be played with the same ball as was used in the previous turn. In informal home croquet youngsters and beginners can be encouraged by awarding them a generous allowance of bisques which might help them to keep up with more experienced players. A popular version of the Association game may be played by three or six players using six balls. Each side has two balls, blue and black, red and yellow and green and brown. The order of play is blue, red, green, black, yellow, brown. Although there are six balls on the court a player may only play four of the balls in a turn, and at the start of the turn must nominate which pair of his opponent’s balls he is playing in addition to his own. For example the player playing blue and black may nominate 20 either red and yellow or green and brown for that turn, and may only play those two balls in addition to his own in that turn. If, during the course of a turn, a player roquets one of the balls he hasn’t nominated his turn ends and the balls are replaced in their original positions. If, however, in the croquet shot an unnominated ball is hit it is treated as an obstruction on the court, the same as a hoop or the peg, the balls remain where they stopped and the player plays his continuation shot. In all other respects the game is the same as four ball croquet. 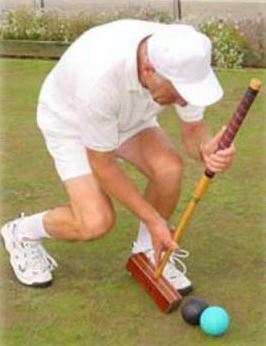 This form of croquet is commonly played in the United States. In most respects it is similar to Association croquet, but there are a few important differences. The court layout and direction of play is the same as in Association croquet, except that there is no baulk line or yard line. If a ball goes out of play it is replaced nine inches from the boundary directly in from where it went out of bounds. Instead of starting from either baulk line, each ball plays the first shot from the starting area, which is a mallet’s length directly in front of wicket No 1. Players don’t have the option of playing with either of their balls, which must be played in the sequence of colors shown on the stake, i.e. blue, red, black, yellow. A ball that has not scored the No 1 wicket has only one shot per turn and is “dead” on all balls that have scored the wicket. A ball that has scored the No 1 wicket may not block the shot of, or hamper the swing of any ball that has not scored the wicket. Neither may a ball that has not scored the wicket block the shot of one which has made it. If either occurs the blocking ball is lifted and replaced after the shot. A ball that has not scored the No 1 wicket may hit any other ball that has not scored the wicket but no roquet is made and the turn ends unless the striker’s ball scores the wicket. A ball that scores the No 1 wicket gets a continuation shot but is “dead” on all balls that have not scored the wicket. Roquet, croquet and continuation strokes, which are called Bonus strokes, are the same as in Association croquet, but with, again, some important differences. If a ball scores a wicket and then in the same shot hits another ball it is not a roquet, both balls remain where they lie, and the striker takes a continuation shot. If, after scoring a wicket, a ball goes off the court, the turn ends. When a striker roquets a ball his ball becomes “dead” on that ball and he may not roquet it again until after scoring a wicket. When a wicket is scored that ball becomes “alive” on all the other balls and may roquet them again. If a striker ball hits a ball it is “dead” on, the balls are replaced to their former positions and the turn ends. When each ball of both sides scores it’s “one back” wicket (No 7) the opposing side has the option of clearing the deadness from one of it’s balls. It must declare which ball it is clearing before the next turn. It is essential that at every stage of the game players should be able to keep track of which balls are “alive” and which are “dead”. “Deadness boards” are used for this purpose and these must be kept up to date at every turn. A ball that has scored all 12 wickets becomes a Rover ball. A rover may roquet each other ball only once per turn. A rover that is dead on at least two balls can clear itself of deadness by shooting through, or being roqueted or croqueted through, any wicket in either direction. A rover remains temporarily dead (last dead) on the last ball it roqueted until after it roquets another ball. Only a rover ball may stake out another rover. These are generally the same as in Association croquet. In tournaments time limits may be imposed. Players are allowed a maximum of 45 seconds in which to play each shot. If the ball has not been struck at the end of this time the turn is over. Merion Cricket Club – Haverford, Pennsylvania – site of the 1998 USCA American Rules National Championships. 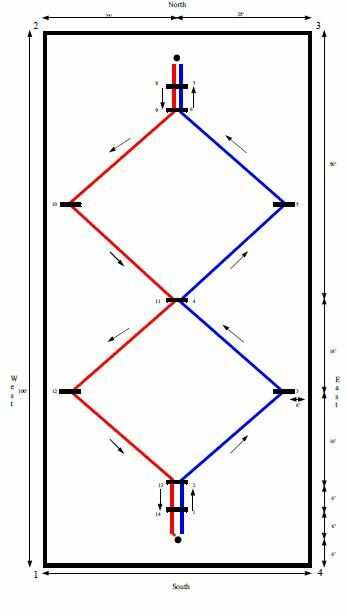 The standard court measures 100 feet by 50 feet and the wickets are placed in a double diamond pattern as shown in the diagram. The size may be reduced to fit available space, but the distance between the Starting/Turning stake and the adjacent wickets should be not less than 6 feet. He may take the two bonus strokes from where his ball has come to rest. He may place his ball one mallet’s head’s length away from the other ball in any direction and then take his two bonus strokes. He may place his ball in contact with the roqueted ball as in a normal croquet shot and take croquet, followed by a continuation shot. He may place his ball in contact with the roqueted ball, and place his foot on his own ball and strike it so as to send the other ball some distance while his own ball remains where it is. He then has a continuation shot. There is an imaginary “yard line” one mallet’s length from the boundary as in Association croquet. Balls that are sent off the court are replaced on the yard line and the turn continues. There is no penalty for going out of bounds. Playing the game with “deadness” as in Six Wicket” croquet is optional. A Rover ball may be staked out by any other ball at any point in the game, not just by another rover ball. 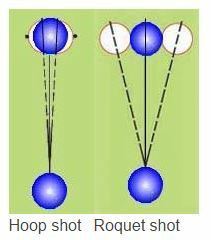 When a ball is able to roquet one or more balls. The striker’s ball when it has made a roquet. Also a ball which is lifted and replaced, for instance on the yard line. An extra turn given to the weaker player in a handicap game. When a player scores more than one point in a turn. When a turn ends involuntarily. 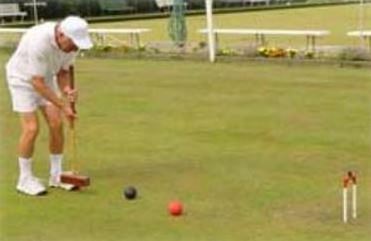 When three balls are in contact on the yard line or corner and a croquet shot is to be played. After making a roquet, when the striker’s ball is placed in contact with the roqueted ball and struck so that they both move. A fault when the striker’s ball is crushed between the mallet and hoop. When a ball is intentionally roqueted off-centre. When a ball roquets another it is dead on that ball and cannot roquet it again until it scores a wicket. A fault when the striker’s mallet hits the ball twice in one stroke. A croquet shot played with a normal follow-through. Usually the result of a foul stroke. The turn ends, the balls are replaced. and no point is scored. A shot in which the ball is struck downwards causing it to jump, usually over another ball in a hoop. To lift a ball from where it lies and play it from a baulk line. When the striker’s ball causes another ball to score it’s hoop. The last hoop but one. Usually “5 back” or No 11. When the rover ball hits the peg, or stake. A ball placed near the striker’s next hoop off which he runs the hoop. The ball positioned near the centre peg in a four ball break. 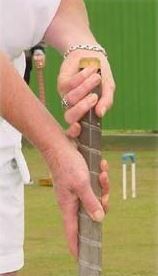 A croquet stroke in which the striker’s ball travels a similar distance to the croqueted ball. To hit another ball with your own. A ball that has scored all it’s hoops but has not yet hit the peg. The Rover hoop is the last hoop to be scored before the peg. A roquet shot in which the striker sends the roqueted ball to a pre-selected position. A croquet shot in which the two balls go in different directions. To line up a shot by walking up the line towards the ball. A croquet shot in which the striker’s ball travels a much shorter distance than the other ball. A croquet shot in which the striker’s ball travels at almost a right angle to the croqueted ball, which moves very little. Positioning a ball where an opponent is “enticed’ to shoot at it. The U.S. term for a hoop. A ball is wired when there are no “open” balls for it to hit, and it has been placed in that position by an opponent. A game in which balls were knocked round a course of hoops was played in medieval France. A variation of the game known as “Paille Maille” was played in a field near St James Palace in the sixteenth century, which later became known as Pall Mall. The modern game appears to have started in England in the 1850s and quickly became popular. The Wimbledon All England Croquet Club was founded in 1868 and the National Championships were held there for a number of years until the croquet lawns were transformed into the tennis courts of today. This probably accounts for the fact that the size of a tennis court is exactly half that of a croquet lawn. Croquet was, and still is, one of a few outdoor sports in which ladies can compete on an equal footing with men. Today Croquet is played all over the World with international tournaments being held annually in several countries. Variants of the game are also played in Egypt and Japan. It is encouraging that an increasing number of young players are participating in the game at all levels. In the USA, three forms of the game are played, International Association Croquet, American Six Wicket Croquet and American Nine Wicket Croquet. 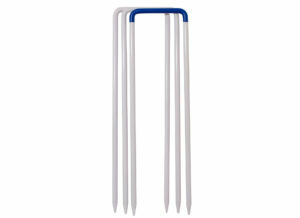 All of these may use the same lawns and equipment except that Nine Wicket Croquet requires 9 hoops, known as wickets, and two pegs, or stakes. Golf Croquet, which is a greatly simplified version of Association Croquet, is also played in many countries, and has a large following. A full size croquet lawn measures 35 yards (32m.) by 28 yards (26.6m.). The boundary may be marked by corner pegs and/or flags. An imaginary YARD LINE extends round the perimeter one yard in from the boundary. The four outer hoops are positioned seven yards in from the side and end lines. The CENTRE PEG is placed in the centre of the lawn, with the remaining two hoops seven yards from it on either side along the centre line. Imaginary BAULK LINES extend along the yard lines from corner 1 and corner lll to the centre. Play starts from either baulk line. The course and direction of play is shown on the diagram. Smaller courts may be used, and for home croquet even lawns with some fixed obstructions can make for interesting and challenging games. 1 1/2 inches in diameter and 18 inches above the ground. A small removable dowel may be inserted in the top to take clips. Clips. (4). Coloured the same as the balls. They are placed on the hoops or peg to indicate the next point for each ball: on the top of the hoop for the first six hoops and on the side for the last six. Clips are important items of equipment. All the players should be able to see at a glance which hoops their, and their competitors’, balls are going for next. So it is essential that each time a hoop is run the appropriate clip should be moved to the next hoop. When a player is making a break he may carry his clip with him until his turn ends, when he should immediately put it on his next hoop. Balls. (4) Coloured Blue, black, red and yellow. Diameter 3 5/8 inches. Weight 1 lb. Mallets. Must have parallel and identical end-faces. There is no restriction on dimensions, size or weight. The average weight is about 3 lbs. The head may be cylindrical or square in cross section and may vary in length from about 8 inches up to 12 inches according to individual preference. The shaft may be made of wood, metal, plastic or fibreglass. The length is usually about 36 inches but this may be altered depending on players heights, individual styles and preferences. Mallets can be made to order and delivered door to door worldwide within a few days by contacting Wood Mallets Ltd.
Nine wickets in a double diamond formation.